At the end of February, under the umbrella of Minnesotans for a Fair Economy (MFE), unions, community groups, faith-based organizations and workers' centers engaged in a series of coordinated civil actions for workers' rights, aimed at major banks and corporations headquartered in Minneapolis. To support and learn from the campaign, CPD sent its lead organizer for economic justice to work closely with Take Action Minnesota, one of our partner organizations in the region. 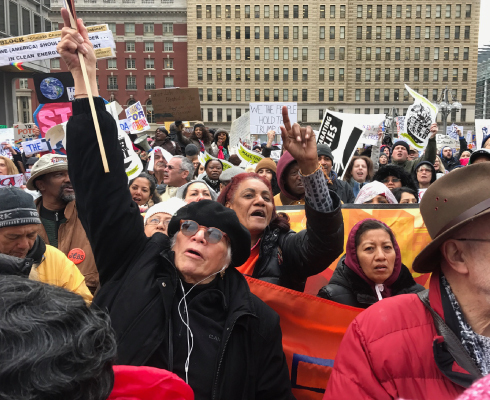 In an impressive display of coordination and solidarity, janitors, subcontracted cleaners, and security workers went on strike one after the other. Demonstrations at Target stores were followed by civil disobedience at Wells Fargo branches and actions at Minnesota’s Chamber of Commerce. Worker demands ranged from improvements to Minnesota’s health care exchange, an end to discriminatory hiring practices at Target, and an end to mortgage foreclosures by Wells Fargo. Take Action Minnesota, a core member of the MFE coalition, focused its efforts on the discriminatory hiring practices at Target which prevent formerly incarcerated people from securing employment. In the past year, Take Action Minnesota has won a series of impressive policy victories as a result of its campaigns. CPD is proud to have participated in this campaign and we are grateful for the opportunity to work alongside Take Action Minnesota in their fight for improved conditions for working Minnesotans.